We have more Robins hanging out in our yard. Just before sunset this evening we watched 3 flocks come in to roost in our mesquite trees. There were over 100 birds all together. We don't see Robins in our yard very often, so this has been an uncommon treat. Not sure if some of these birds are the same ones we saw about 3 weeks ago, or if this is part of a different group passing through on its way north to breeding grounds. Love to hear the robin go tweet, tweet, tweet..."
The corn meal we buy has a recipe for corn bread printed on the side of the box. We have been experimenting with that recipe, trying to modify it for use with mesquite flour. Our first few modifications were delicious but extremely crumbly - due to the lack of gluten in the added mesquite flour. So instead of replacing a portion of the whole wheat flour with mesquite, we substituted part of the cornmeal. 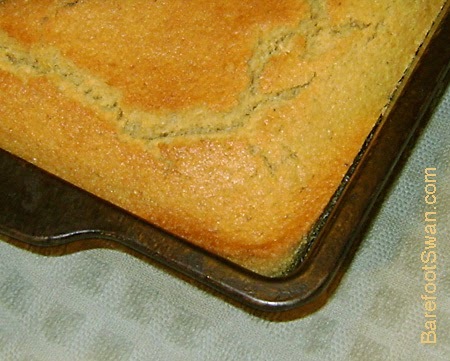 The resulting Mesquite Corn Bread has a sweet honey/brown sugar flavor. Still a little crumbly, but we can live with that. Stir all dry ingredients together in a large bowl. Make a well in the center and add the wet ingredients. Stir wet and dry ingredients until blended. Pour batter into an oiled 8" square pan, and bake for 35 minutes at 350º. 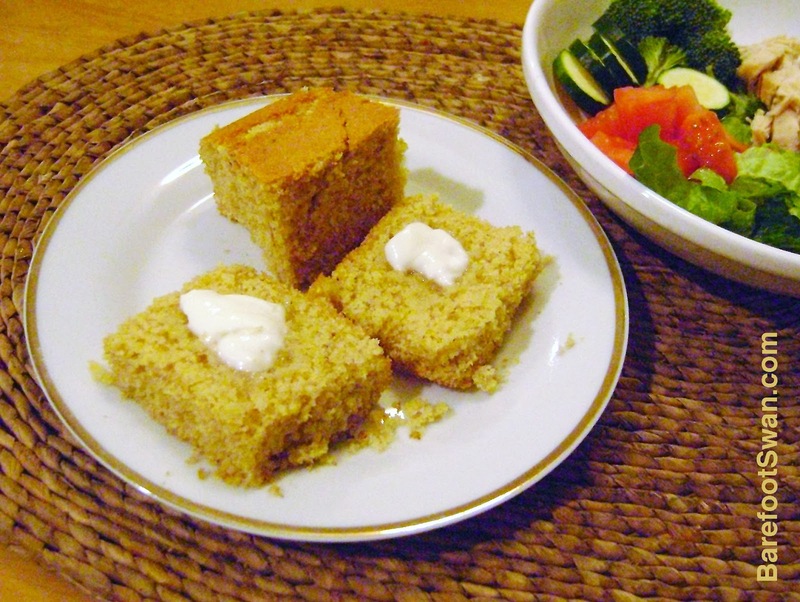 Cut corn bread into squares and serve with honey, jam, and/or butter. Cover and refrigerate any leftovers. 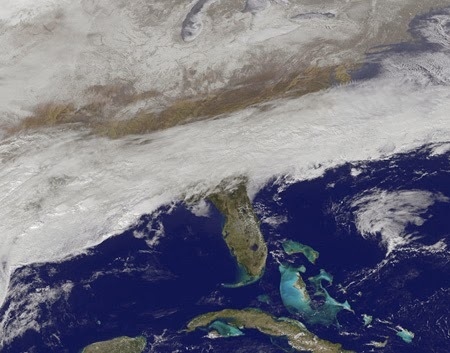 Photo of major winter storm over southeastern US on 11 Feb 2014. While much of the rest of the country has been pummelled repeatedly by historic winter storms and freezing weather, we are still enjoying unseasonably warm temperatures here in the California desert. Highs have been in the low 80's, which is about 10 degrees above normal for this time of year. It even crept up to near 90º a couple of days ago. 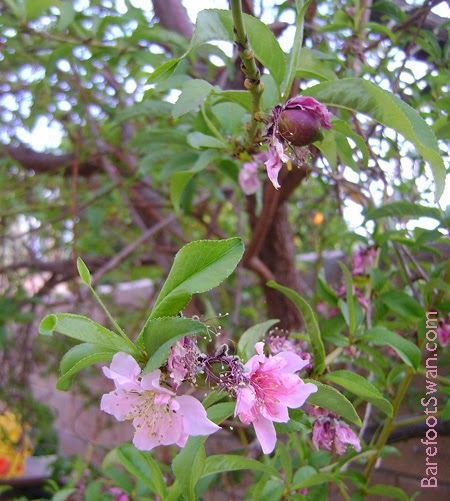 Our nectarine tree has been blooming for a couple of weeks, and is already starting to set fruit. 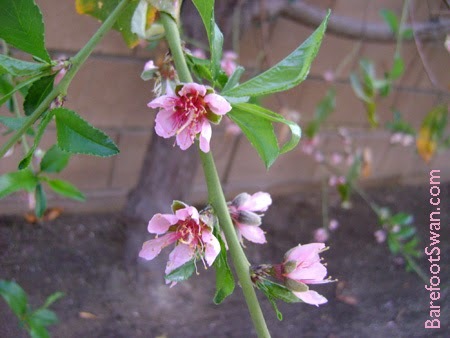 The peach tree is about 2 weeks behind the nectarine. It is covered in blossoms and new green leaves. The apricot tree is still snoozing. 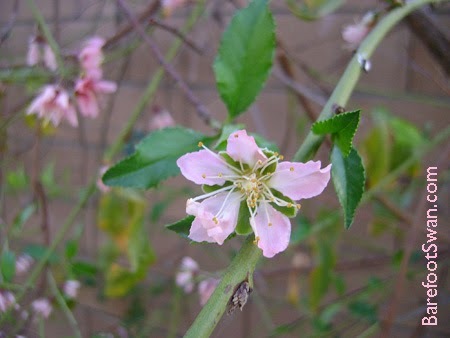 It is always the last of our 3 fruit trees to bloom.